I really liked this product. And it smells really fresh. The only downside is that it is a little drying. I didn't like these, they were way too drying and irritating. The pads contain too much alcohol to help with acne, and just end up irritating and drying out your face. 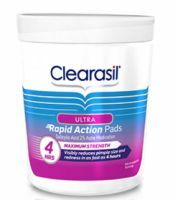 Does help get rid of acne, but like other reviewers have said, these pads can be drying and can burn so make sure to avoid eyes and don't use if you have any sort of wound on your face! I like to use these when I break out but I have to be sure to put lotion on after.